A newer variety of upscale HK lifestyle - modern pseudo european. There are of course quite a few high end italian furniture retailers, catering to a younger taste than the cosmo chic set. 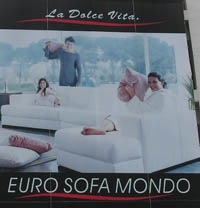 I couldn’t resist the potential pillow fight motif - “La Dolce Vita” indeed. In the interests of full disclosure I should mention that I bought some ‘italian design-chinese execution’ (mainland knockoffs) - from them and have to say they were very nice + accommodating. They even volunteered the chinese origins of the pieces, something locals don’t always do. I've scavenged my first few original posts and will be putting them up soon as well. Still figuring out the place image option in Rapidweaver, which I highly recommend by the way. Far superior to Word Press (well meaning but ponderous at best).